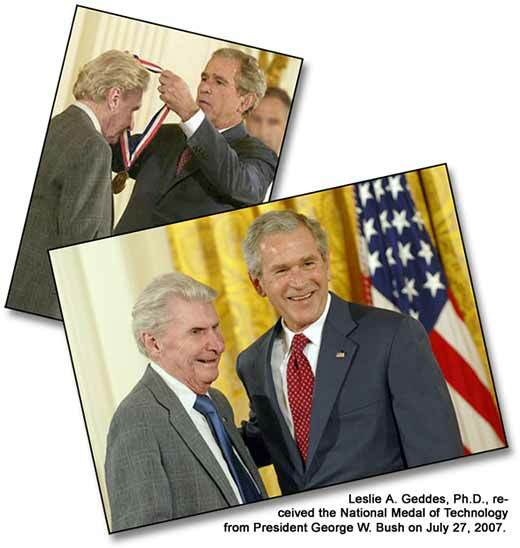 “Geddes, 86, retired in 1991. But, as he told President Bush, he’s in the laboratory every day. Why? ‘I wouldn’t know what to do,’ he said. ‘I’m not done yet.’ … He’s written more than 725 scholarly articles, authored, edited or co-authored more than 20 textbooks and developed more than 30 patents, including one for a pacifier that delivers medication to infants,” a story in the Journal & Courier reads. Use those links to the stories I quoted from to read some details about one of RCA’s remarkable members. Leslie received the Club’s Henri Busignies Memorial Award in 1997, and he became a Fellow in 2001. Leslie was the youngest radio amateur in Canada when he earned a license there in 1935 at age 14. “I had to log off the air in 1939 because World War II started in the British Empire,” he told me when I spoke with him last year. After the war ended and Leslie was busy with college studies, he did not continue with amateur radio. “I often wish I had gotten back into ham radio,” he said. He keeps busy enough, though, arriving at the laboratory as early as 4:30 a.m. to 5 a.m., according to the newspaper stories. By the way, my favorite story about Leslie receiving the medal is in Purdue’s student newspaper, the Exponent. It’s more personal. I often like stories in student newspapers better than stories in their commercial newspaper counterparts. This entry was posted on Monday, August 13th, 2007 at 11:41 am and is filed under RCA news. You can follow any responses to this entry through the RSS 2.0 feed. You can leave a response, or trackback from your own site.